At Curti & Associates, Ltd., we specialize in practical and elegant design solutions that result in beautiful and functional landscapes. By creating a balance between architecture and landscape, our designs merge your home with its natural surroundings and reflect your personality. The overall outcome is an outdoor extension of your indoor living aesthetic. A properly designed structure will withstand the elements for centuries. If it's not built properly, it may not survive past the first freeze. Stone features are permanent and they're a great investment for any home. The beauty of stone and masonry creations will last for generations. What better way to reflect your personality than with the natural timelessness of a pond or waterfall feature! 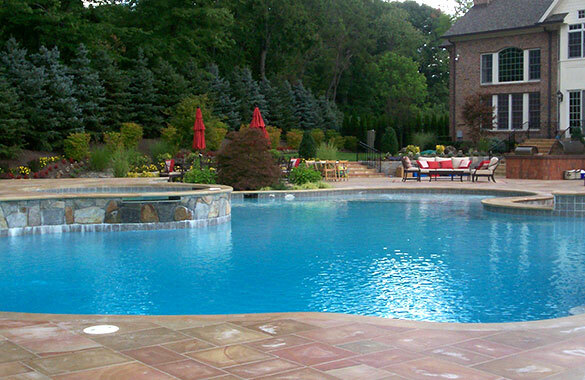 We'll help design your aquatic paradise with your particular requirements in mind. There are a variety of water features available including ponds, streams, waterfalls and more. We'll work with you until we find the one that complements your landscape.